Imagine a closet full of clothes that you love. You quickly get dressed because every item that you grab has many other items in your closet that work so well with it. and. make. you. feel. good. I have a concept to talk to you about today - capsule wardrobing - and a FREEBIE to get you started! When I first heard about the concept of a "capsule wardrobe," I was actually very skeptical and rather resistant. It just seemed too minimalistic and limiting. I sew a lot and enjoy buying fabric. Despite how many clothes I have, though, I still have those moments where I stand in my closet and say "I have nothing to wear!?!" Or, sometimes, I finish a garment and realize that I have nothing in my closet to wear it with. Yikes! So, I have been thinking a lot about capsule wardrobing and finally realized I needed to somehow adapt some of its principles to my life. Of course, I am adding my "avid sewist" spin on the concept. I started to do my research to see how I could have a more streamlined closet, and I think starting with just my athletic clothes and giving myself a month to work on it is a nice, doable goal for me. What exactly is a capsule wardrobe? It is just a fancy way of saying that you have coordinated and versatile clothes in your closet and that you can get multiple outfits out of each piece. The focus is on selecting top-quality, long-lasting pieces of clothing that you love, that match your lifestyle, and that you feel good in. You may invest more in each piece, but you save money in the long run because you do not have an overwhelming amount of clothes. When done correctly, you have a closet full of clothes that bring you joy and getting dressed is not full of tears. A lot of the resources I have read focus on limiting the number of garments in your capsule to a set number (usually like 24-37). You have a certain amount of bottoms and tops and then there is a grid that looks like math. AND THERE YOU LOST ME. I like math. Don't get me wrong, but I felt like I was getting lost in the weeds and nothing was sinking in. I will never have a complete wardrobe, and I will never limit myself to only a certain amount of pieces. I enjoy sewing too much and will continue to buy fabric and sew despite how complete my wardrobe may be. So, don't worry, I just cannot tell you that 37 items is enough (at least not today!). I think the point of this capsule challenge for me will be (1) to add more mindfulness and planning to my fabric shopping and think twice before I grab fabric just because it is on sale. (2) to be more mindful of sewing patterns that are more functional for my lifestyle (as opposed to jumping at every trend - my time is precious! ), and (3) to reduce decision fatigue when I get dressed. The more streamlined my wardrobe is, the more I am not staring at a bunch of clothes that don't match or fit me correctly! Download and Print Your FREE Greenstyle Fit Capsule Planning Worksheet here. If you want a blank planning sheet to fill in your own patterns, you can Download and Print Your FREE Blank Capsule Planning Worksheet here. This is that fun step where we are going to pull out all the fitness clothes in our wardrobe. You can do it Marie Kondo style and put them all in one big pile. Go through them, try them on. Think about what you love about each piece and what you don't. Divide these clothes up into three piles: (1) keep (it's in great condition, and I love it! ), (2) I am not sure, and (3) toss/donate/recycle. For pile #1, make notes in your worksheet about what you love about each item. Think about the colors you gravitate towards and the styles that make you feel your best. Do you have a select few pieces that get the most wear? Now, let's decide what we are keeping from pile #2. I think it is helpful to make lots of notes on your worksheet for this step. At the bottom of page 2, fill out all those empty lines with your notes from your purge. Make notes about color, how often you wore it, why you are not sure of it. If it is an item that you really do love but is worn out, make notes to replace it. If it is an item that can be altered, send it to your sewing room to be fixed. If it is an item that you love but are no longer that size, have a storage bin handy to store it out of your closet. I have a hard time parting with maternity clothes (the last time I threw them all out I got pregnant!). Step 2: Pattern Choices - What Do I Have and What is Missing? Keep your worksheet out for this one too. You have 4 categories to keep track of: tops, bottoms, undergarments, and layering items (sweaters, pullovers, etc.). I did not include accessories (shoes, hats, gloves, etc) on your worksheet, but feel free to include them in your style notes if that is an item you need for your fitness lifestyle. Make careful notes for each category as to which pieces you have and which ones you need to add. Do you have 20 pairs of leggings and not enough tanks? Are you wearing the same few bras repeatedly? Is your favorite top pilled and worn? Write down real numbers. Your list of items that you need to add to your closet may be rather bare bones right now so this is the step where we translate what we need to actual patterns. If you need 5 tanks, this is where you decide which tank patterns you want to sew. Maybe you want them all to be different patterns. Also, don't be swayed by having a closet full of trends. Make sure you are also picking staple pieces that are useful and match your activity level and lifestyle. Step 3: Let's Decide on Color!! If you skip any step, do not skip this one! This is probably the most crucial step that will reward you greatly when this process is over. Before you even start to look at fabric, we have to decide on colors. Let's start by looking at what you kept in Step 1. What trend do you see? Do you already have a special item that you want to build your wardrobe around? Look through photos of yourself. What colors make you look good? What colors wash you out? What colors do you always grab first? I went through lots of capsule wardrobe plans and so many of them were so.... well, blah. Their color choices and lack of brightness and prints made me want to abandon the whole process before I started. They were not ME and looked nothing like fabrics I would buy or wear. So, make sure that you aren't so busy focusing on what you think the right answer someone else would pick or your favorite Pinterest pin looks like. Pick YOU and what you know you will wear. I found this Color Guide very helpful. My favorite color is pink, and surprisingly, it's suggestions were pretty spot on for me! If you want to do more research into what colors look good ON YOU, I found this article to also be very helpful. Step 4: Fabric, Fabric, Oh My! Now that you know what patterns you need and what your color palette is, it is time to pick fabric. Pull out all the fabrics from your stash that go with the color palette you selected in Step 4. Take each item you are planning to sew and pair it with a fabric. Pay special attention to balance. You do not want all prints or all solids or all one color in any category. The exception to this for me is that I notice that I am more likely to wear a layering item if it is a solid because it will go with so many more outfits. Use as much of your stash as possible, but if you do not have it on hand, now is the time to go fabric shopping! That part is always so much fun, but be focused and stick to your plan. Only get what is on your list! Don't get distracted with buying something just because it is on sale, and don't get swayed and buy all prints. Remember: balance and stick to your plan. Step 5: It's time to SEW! It's time to execute your plan!! For the Greenstyle FitCapsule Challenge, you can win a prize each week by participating! For Week 1, print off your worksheet and start planning. Post in the group what you are working on. Ask questions. Let's sew our capsules together! 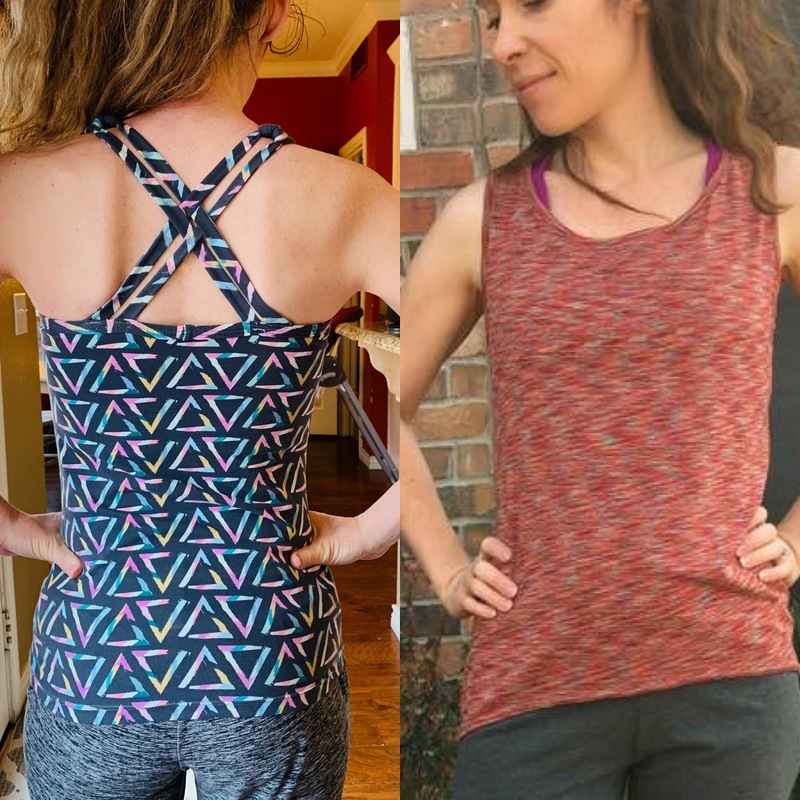 To be eligible for the Grand Prize at the end of the challenge, you need to have sewn at least 3 new items using Greenstyle patterns that are part of your new athletic capsule. When I started working on my plan, I looked through photos of some of my favorite athletic Greenstyle makes that I wear often. 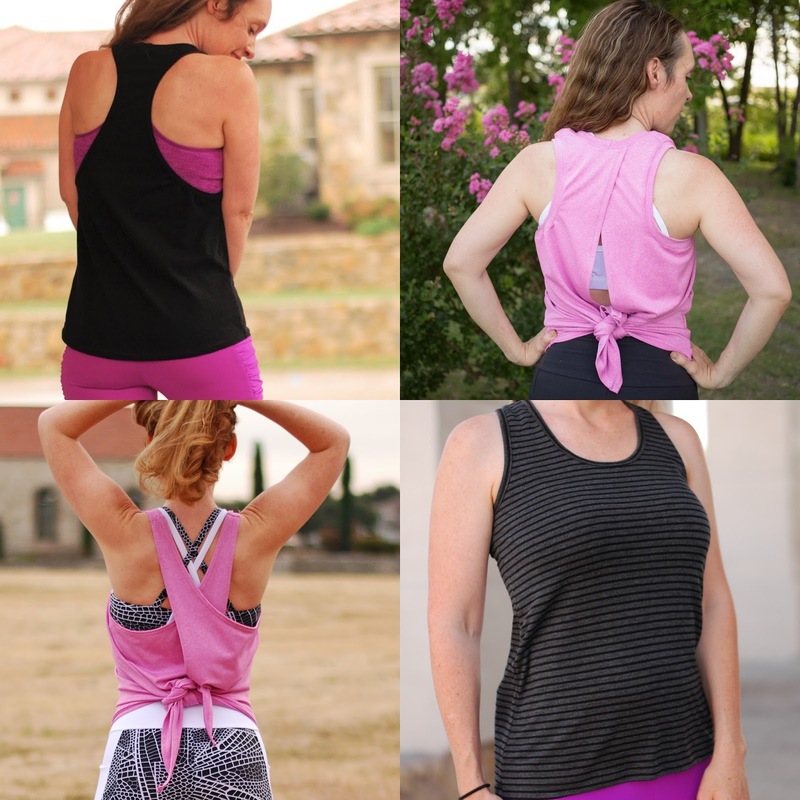 (1) Tops (from left to right): Solo tank, Tie Back tank, Xpress tank, and Lille Racerback tank. Tops (from left to right): Jillian Tank with the included built in shelf bra and Lacy Slope Tank. 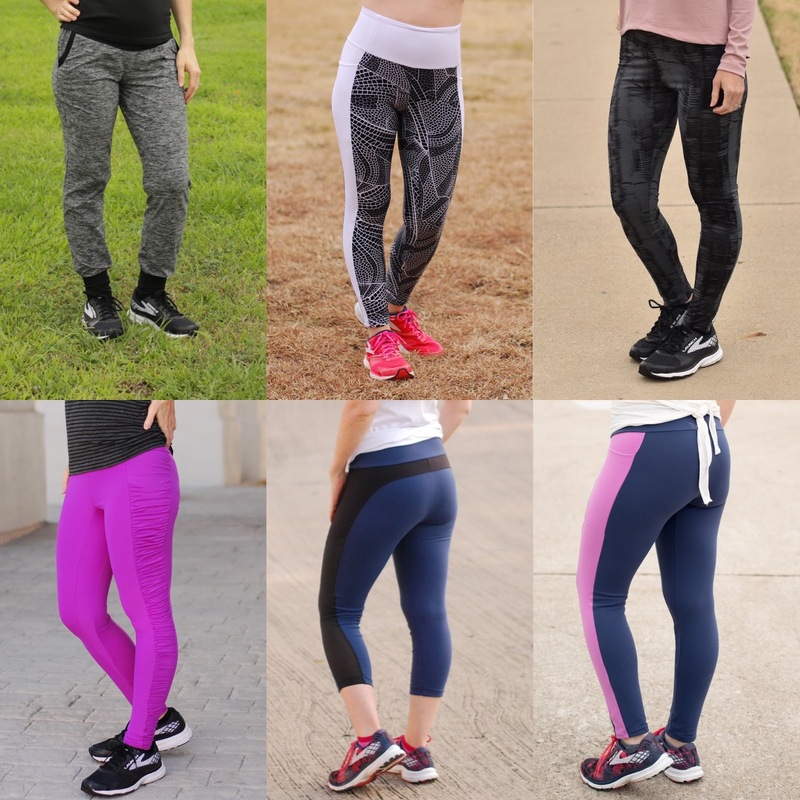 (2) Bottoms (from left to right and top to bottom): Brassie joggers, high rise Super Gs, Inspire tights, modified Super Gs, capri Stride Tights, midrise Super Gs. Bottoms (from top to bottom): Brassie jogger shorts and Moxi Shorts. 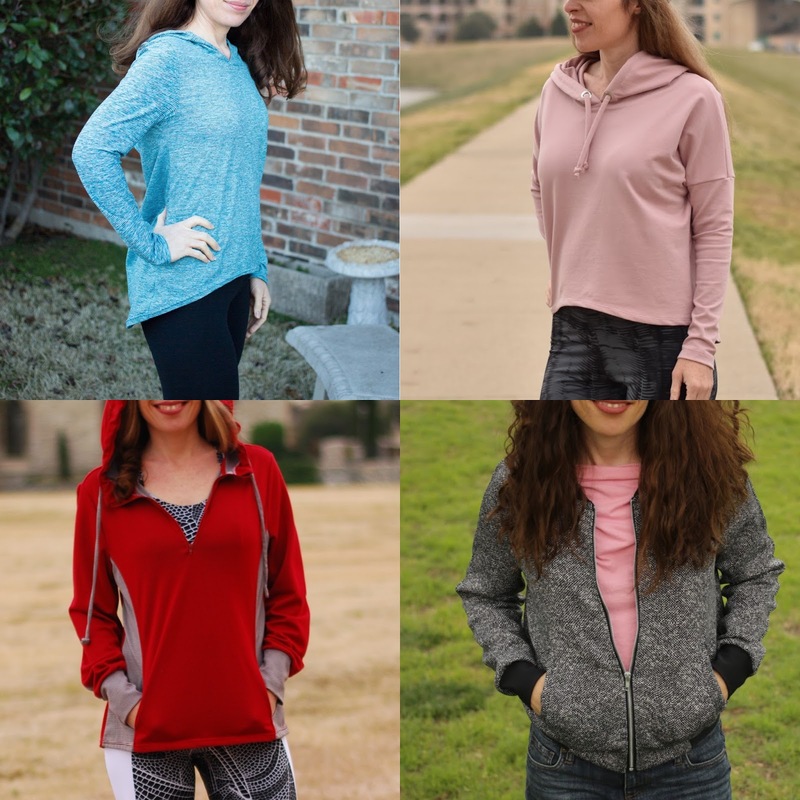 (3) Layers (from left to right and top to bottom): Lacy Slope Hoodie, Studio to Street Hoodie, Pacific Pullover with Hood, and Midway Bomber Jacket. Now that you have seen a few of my Greenstyle makes all together, do you see my color scheme? Can you catch what does not belong? Just putting these photos together made it really easy for me to see the items I need to replace and what I need to make for this challenge. Stay tuned to find out what I make! Don't forget to --- Download Your FREE Greenstyle Fit Capsule Planning Worksheet or Download Your FREE Blank Capsule Planning Worksheet.